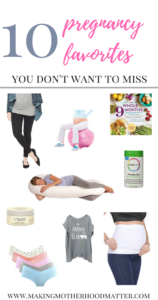 Inside: This list includes the best pregnancy essentials like prenatal vitamins, maternity clothes, favorite books, a pregnancy nutrition guide, and more that will make your life better. Moms are the best resources for finding valuable information, I just wish someone would have shared their list of their amazing pregnancy favorites with me. So, I created one for you. 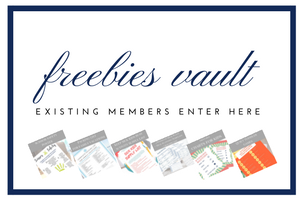 This list includes my picks for prenatal vitamins, maternity clothes, favorite books, nutrition guide, and more. Here are my top 10 pregnancy essentials that will make your life better. It was challenging for me to eat healthy during both of my pregnancies. Having a week-by-week nutrition guide with recipes is so helpful. 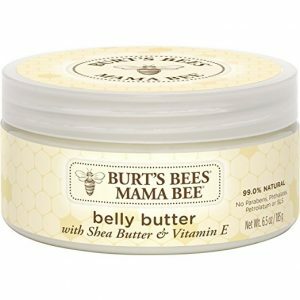 My skin felt like it was stretching to the maximum when I was preggo, so this belly butter was my bestie. I always applied it after I got out of the shower and whenever my skin started to feel itchy. Ok, so I am a total nerdy mama and I loved knowing everything that was happening in my body and with my baby’s body as she developed. 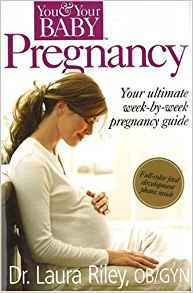 This one called You and Your Baby Pregnancy: The Ultimate Week-by-Week Pregnancy Guide, was written by an OB/GYN. It gives weekly updates on what is happening with your baby, your body, and frequently asked questions. 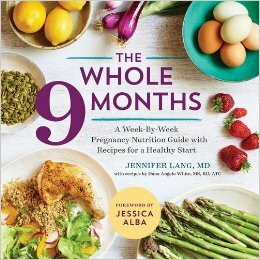 I also have a second book that I highly recommend to every pregnant mama I meet because it was such a lifesaver for me. It’s called On Becoming Baby Wise: Giving Your Infant the GIFT of Nighttime Sleep. I am a huge fan of this book. If you would like a summary of the ideas covered, check out Survival Guide for Sleep Deprived Parents: 7 Strategies to Help Your Baby Sleep Through the Night. 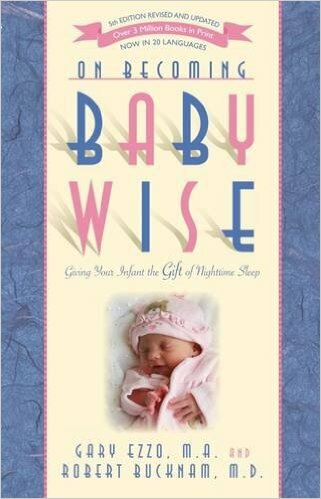 This book gives advice on how to get your baby to sleep 8 hours at night by 8 weeks. I used it with both of my babies. 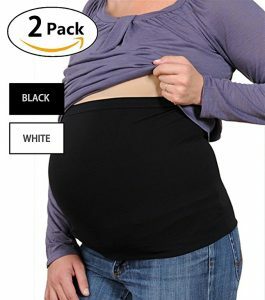 Because when everything inside of me felt like it was pushing out on my belly, it felt amazing to have the support of a belly band supporting my stomach. I tried literally at least six different brands of prenatal vitamins but they all made me feel nauseous. 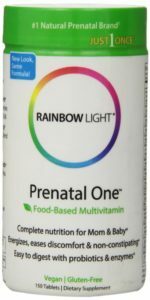 Finally, I researched prenatal vitamins online and this Rainbow Light vitamin had really good reviews. It is food-based, easy to digest and is free of any animal products. 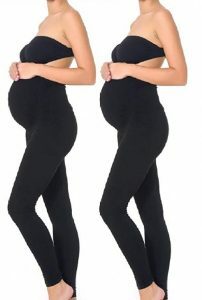 I love wearing leggings when I’m pregnant because you can’t beat stretchy pants with a full coverage belly panel for extra support. Ever since I bought this total body pillow, I have slept so much better. This pillow supports your hips and chest so that they are in better alignment when you lay on your side. I love to sleep on my stomach, so this pillow was great for helping me get comfortable so I can sleep on my side. I love these tanks because they are long and stretchy so they cover everything, plus you can use them to nurse in once the baby is born. One week when I was pregnant I threw away a pair of underwear every day for a week because they were too tight. Finally, I came to the conclusion it was not my underwears fault that they were uncomfortable, it was mine. When I finally ordered some comfy underwear it was so much better. I used a birth ball to sit on when I needed to open my hips, when I was uncomfortable when I would have Braxton hicks contractions, and in labor. You can even use it after the baby comes to help mimic the movement in the womb. 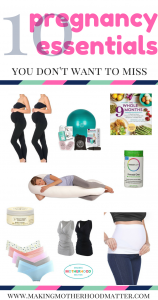 What are your favorite pregnancy essentials? P.S. You may also enjoy What To Say To A Pregnant Woman And 3 Things To Avoid. Love the blog!! Can't wait to see more ;) p.s. how do you have time to be this fab!?!?!? !